An Eclair is made from a light dough called Choux pastry. The same dough is used in making cream puffs and proﬁteroles. 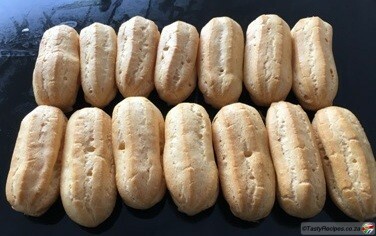 Choux pastry can be used for both sweet and savoury dishes. It is baked until crisp and almost entirely hollow inside as it puffs up to 3-4 times its original size. For a sweet filling, it can be ﬁlled with cream and topped with chocolate. In a bowl sift the flour and the salt. Boil the water in a medium sized heavy based pot and add the butter and allow to melt, then increase the heat and boil rapidly. Remove from the stove and add all the flour and stir with a wooden spoon until the mixture comes away from the sides of the pot and has been completely absorbed by the water. Remove from the heat and let the mixture cool for a few minutes. Once the mixture has cooled add the eggs one by one, beating well in between each addition of eggs. The mixture should be firm enough for piping. 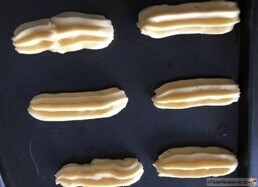 Spoon the mixture into a piping bag and pipe long choux buns (about 8cm) on the baking tray. Bake for 20-25 minutes, remove from the oven and make a small cut on the side of each to release the steam. Place back in the oven, with the oven on 140C. and bake for another 5 minutes or until the puffs are dry on the inside. Keep in an airtight container until needed. Fill with a sweet cream and coat with the chocolate glaze. Place heavy cream in a wide glass bowl. Heat in the microwave on high until steaming, about 1 minute. Add chocolate, and whisk to combine. Let it rest for a few minutes until it reaches a dipping consistency then coat the top each eclair with the chocolate.